September was a busy month, full of life and excitement. Now a week into October at a totally different speed, I notice some new practices in response to the life conditions of September that I choose to continue. I visit the river every day. Every weekday in September we had contractors on hand to put a new roof on our home. I work at home, and before I get to work I have a routine of some physical practice and journaling. The contractors’ noise was too much, so I walked over to the river valley for a beautiful view and a bench. (See Writing from the red chair.) The contractors are gone, but I still head out in the morning for some time alone with me, the river and the city. I write at night. Every Tuesday, Wednesday and Thursday in September I was working as Interviewer and Harvester at the Integral City 2.0 Conference. We hosted 36 sessions (three each day, twelve days) and interviewed over 60 visionaries. I played the role of interviewer, and when not interviewing, supported the host and interviewer by catching audience questions and crafting questions for break-out groups’ exploration. At the end of each day, I wrote a ‘harvest’, my meaning of the day for immediate publication on our web site. This schedule meant for some very late nights during the week. I am finding now that I am inclined to write for a couple of hours each evening. I am not totally exhausted in the morning because this somehow fuels me. I stop to breathe. In the middle of September’s craziness, I took some time to pause and deepen one of the ways I gather with people: circle. I attended Christina Baldwin and Ann Linnea’s Circle Practicum. One of the most meaningful learnings for me from this experience is the importance of pausing for breath. Ring the bell, take a breath, then ring the bell again. This is useful when feeling frenetic, or when something profound has occurred, when there is a transition of some kind, etc. We even came up with a way to articulate this by text in the digital world: *~* I am no longer sitting in circle for several days in a row, but I circle up with myself and I choose to notice when I need to stop and breath. Sometimes I even use a bell. I pay attention to my energy. There is a lot of synchronicity in my life right now around personal energy. At the Circle Practicum, and several times throughout the Integral City 2.0 Conference the word ‘energy’ and practices around knowing and cultivating personal energy surfaced. I recognize that I have been intrigued by this for a while, but not yet able to explore this in my personal development. I sense a whole new area of learning here for me. One of the gifts of September is curiosity about where my energy is, where I choose to put it and how it moves throughout my body. I am also curious about how energy behaves between and among people. I choose now to pay attention to the subtleties of my body and being. Each of these new practices are in response to my life conditions of last month, yet I have chosen to stick with them even though the reasons for them are gone. In some way, each of these are responding to today’s life conditions too. A reminder that my posts are not appearing here on Tuesdays, Wednesdays and Thursdays in September. My writing attention for these days is going to the Integral City Expo and eLab, where I am providing a written harvest for each day of the conference. I realized last week that this is a paying gig to write about what I am passionate about – our evolutionary relationship with cities. It’s not lucrative, but there is a transaction. I write and I will be paid. I write and it will be read. Even better – I get to have a front row seat on what’s happening, even be the interviewer for 7 sessions. This is a marathon endeavour for the month of September and it is a thrill. The Integral City Expo involves 50 visionary speakers in 36 sessions over 12 days. Each day focuses on one of the 12 evolutionary intelligences of cities. I am tired at the end of day 2, and I have yet to write today’s harvest. Go to this link to register and listen to the 30 remaining sessions live as part of the Expo. For a small fee, you can get MP3 downloads and my take on each day’s intelligence. Tomorrow’s focus is Living Systems Intelligence, with an opening session with Elisabet Sahtouris. The words willful unfolding have continued to unfold! Relentlessly. As part of the Integral City conference, I have four roles: co-design the eLab program with Marilyn Hamilton, interview many of the 50 visionaries we have gathered, speak to participants about the role of the Integral City master rule (take care of self, take care of others, take care of place), and harvest the meaning we make of what we are learning. As we have been working on the conference, we have been struggling with making sure that we create the conditions for the transfer of wisdom from people who have been living the 12 evolutionary intelligences to participants. These are the 36 live sessions that form part of the conference. We are also aiming to create the space for an asynchronous community space that allows the participants to meet each other and make meaning together. Holding this latter intention as been my role as the Harvester. Up until today, I have had no idea how our harvest function was going to take place with our technology choice. I have willfully held on to the intention to create the conditions where the emerging Integral City Collective is able to connect as a collective, rather than as individuals. We wish to create the conditions to see the collective, to discuss within the collective. To interact with the collective. To be a collective. The way to go about creating this kind of space has been very slow in unfolding. I have had to be patient as we made decisions about the technology we use and whether it can hold the dream of a collaborative space that can hold us in our exploration really well. Our challenge is that the technology platform we are using is moderately good at setting up individuals to connect with each other. Not more. And at this stage in the game we are not in a position to change our platform so we are making lemonade out of lemons, as one of my colleagues puts it. We will make great lemonade together. Whether we meet face to face or virtually, the quality of our interaction comes with what we each bring and the spirit in which we conduct ourselves. Regardless of the structure, physical or virtual. This is how we will make lemonade. And the lemonade will nourish the next iteration of the technological structures that we need to serve us well in our virtual worlds. The lemonade will serve the next unfolding. It is 13 days until showtime, when the curtain goes up for the Integral City Expo and eLab on-line conference. We have a lot to do and we could have chosen to focus our time today on tasks, but we made a different decision today. This was a wise choice to spend our time this way as we head into the chaos of putting on a month long on-line conference. We are grounded in the understanding of our shared calling to work together, even when most of us have never met face-to-face. Our trust in each other has been amplified. Our shared, emerging purpose has been amplified. As we move into crunch time, our ability to priorize with purpose will be amplified. We are ready to forge ahead. Here is the poem that emerged from our time together, our feedback loop to ourselves, grounding our selves and our work serving cities and citizens as we design for our unfolding future. Earth is now a planet of cities. The implications of this stage in our evolution are going to be discussed in 15 days by world thought leaders in the first week of a four week online conference: The City 2.0. Here is a quick review of what is happening Week 1 (please enjoy the links to web pages with some information about these folks). On Tuesday September 4, Bill Rees, co-author of Our Ecological Footprint, will begin Day 1 of the conference exploring the contribution of ecosphere intelligence in cities. Brian Eddy and Michael Zimmerman will follow, giving us examples of how ecosphere intelligence contributes to city design. We will wrap up the day by setting the stage for participants to share stories of living ecosphere intelligence by hearing the stories of Karen O’Brien, Lummina Horlings, and Gaston Remmers. Day 2, on September 5, will begin with Buzz Holling‘s take on emergence and complexity in cities. Jan de Dood and Harrie Vollaard will give us examples on how emergence and complexity contribute to city design. Day 2 will conclude with some stories of what this intelligence looks like in real life, starting with Ian Wight and Will Varey. Week 1 concludes on September 6 with a look at living systems. Elisabet Sahtouris starts us off on Day 3 with a look at life cycles and aliveness in the city. Darcy Riddell and George Por will show us how how to apply living systems intelligence. The day will conclude with a round of stories about implementing living intelligence. Bjarni Snaebjorn Jonnson and Roberto Bonilla-Nunez will get us started. These folks come from around the world. Appropriate for a week’s exploration of Earth as a planet of cities. They hail from Canada, The Netherlands, the United States, Scotland, Norway, Iceland and Mexico. Their work takes place on planetary and local scales. They look at cities integrally, examining the city ‘s interior and exterior perspectives. Among them they are thought-leaders, scholars and practitioners. They are a wonderful blend of what it means to think about cities integrally, to feel cities integrally and to embody cities integrally. That’s week #1 in a nutshell. For more information, please explore the conference web site. Speakers’ bios can be found here. I will be interviewing Brian Eddy and Michael Zimmerman on the opening day of the Integral City eLab, Tuesday September 4, 2012. We will be exploring ecosphere intelligence, our awareness and capacity to respond to a city’s climate and eco0region. Honour the climate and geography of your city. Add value to the earth space. Day 1 will conclude with ecosphere intelligence practitioners Karen O’Brien and Ina Horlings, and a look at integral approaches to climate change and sustainability. Click here for information on the eLab. Stay tuned for more information on the eLab and details on how to participate. The Integral City eLab is taking place from September 4-27, 2012. Our mission – to pool curious minds to co-create an exploratory space for anyone wishing to create cities that serve citizens and cities well. We aim to create the conditions for a new, life-giving story for our cities, the habitat we create for ourselves to ensure we thrive. The purpose of the eLab is to create the conditions for these three principle to gain life, to change how we think about our cities. Our cities are a part of our evolutionary story and a significant part of the systems we humans build to support ourselves. It is time to understand city systems. Each day will explore one evolutionary intelligence through three questions and three principles that guide the intelligence. This will be done each day at three scales (three sessions each day): a thought leader, people who design for this intelligence and the stories of practitioners of the day’s intelligence. Over the next couple weeks I will be highlighting the speakers that will be sharing their work, life and stories about our relationships with our cities. 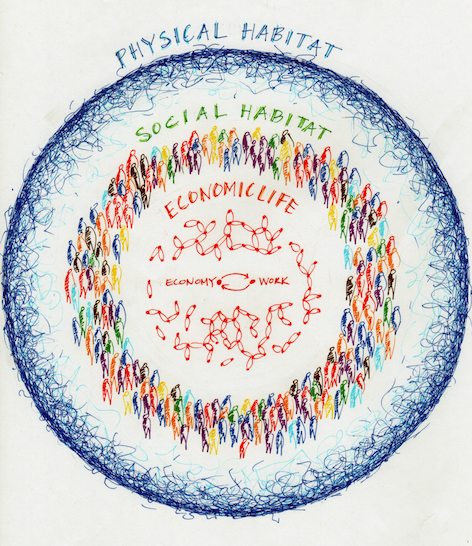 Integral City eLab is 12 days of webinars from September 4-27 (Tuesday – Thursday each week) and an on-line learning environment to serve as an eLaboratory to explore how to design prosperity systems for the liveable city. Our intention is to create the space and place for people across the planet to share and learn of ideas about our relationship with cities. We will explore big ideas and share stories. Click here for information on the eLab. C0-host eLab webinars. Marilyn Hamilton, David Faber and I will be hosting/facilitating/moderating the 36 eLab sessions. Some will be formal presentations, others will involve extensive Q and A, while others are designed for participants to explore and share their experiences and stories. Blog the eLab. Prior to the eLab I will be writing about the contributions our speakers make to our understanding of cities as whole systems. 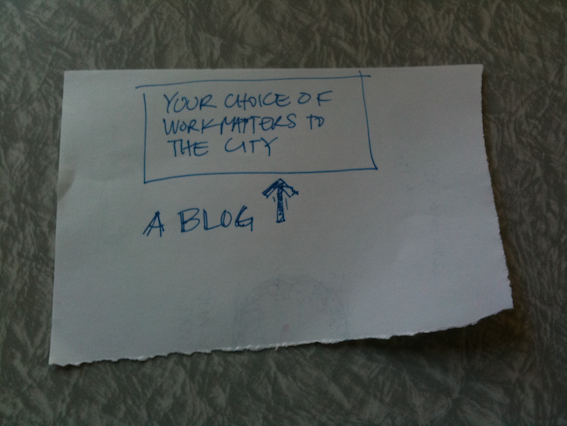 During the eLab I will be blogging about eLab stories and making meaning of each day. I will be creating pieces to head out into the world as well as creating a jumping off points for discussion among eLab participants. Co-create the spaces and places to make meaning. With my fellow eLab organizers, we are holding the intention, and creating the structure for personal and collective learning about ourselves and cities. We are holding this intention for the duration of the eLab and into the future that we can’t see yet. So for Nest City readers, you will see a shift in focus here. For the month of August I will be writing about the speakers that are engaged for the eLab. For the month of September, during the eLab itself, I will be blogging each conference day about meaning I make of the day’s journey. This will be a juicy side-journey that will provide lots of intelligence to put toward the creation of Nest City and nest cities. I look forward to sharing the Integral City eLab with you!